We kick off the final week of October with a new review, one of many planned until the end of the month, Halloween. This game, originally made for mobile devices, is from Mobot Studios. 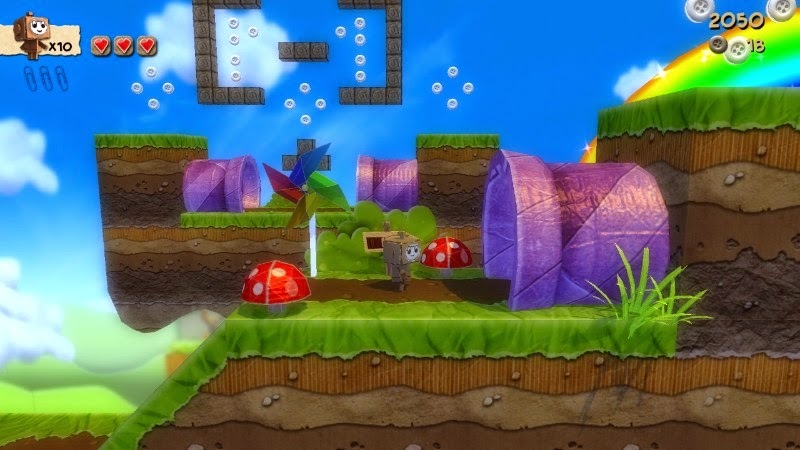 It's Paper Monsters Recut for the Wii U eShop. Let's see if it's a cut above the rest. but for now we're dealing with something better-- papercraft. For someone new to mobile gaming like I am, I had no idea that Paper Monsters was originally a mobile game. Doing some research, I found out that the game was making its first console appearance in the form of an enhanced port with Paper Monsters Recut. No doubt Mobot Studios took this undertaking of porting a mobile game to a major home console seriously, evident by the work easily seen through comparing the two games. 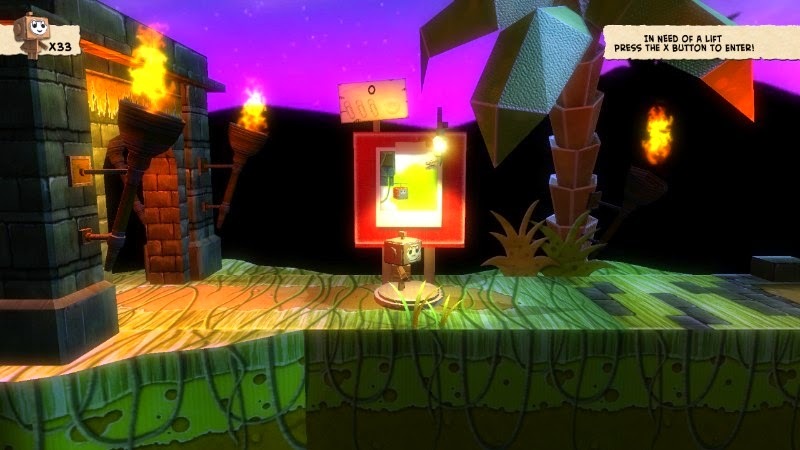 In essence, Paper Monsters Recut takes a tried-and-true take on the old school 2D platformer, and it adds in physical (read: no touch screen) controls to make this Wii U version the definitive one. The entire world of Paper Monsters Recut is made of paper and cardboard. This includes platforms, backgrounds, characters, and more. 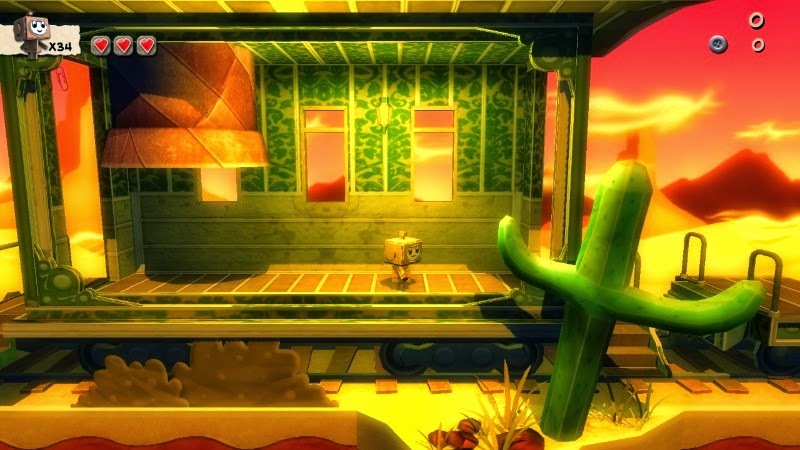 This enhanced port of the original Paper Monsters on mobile features even more to make its unique visual style stand out from the crowd of other eShop titles, such as improved lighting and effects. The colors come from a wide pallet, offering some very beautiful areas. While not everything is perfect tech-wise (e.g. there's some significant slowdown at the start of the Puzzling Pyramid level and rare hard system locks), Paper Monsters Recut looks absolutely glorious on the Wii U, especially if you have an HDTV. 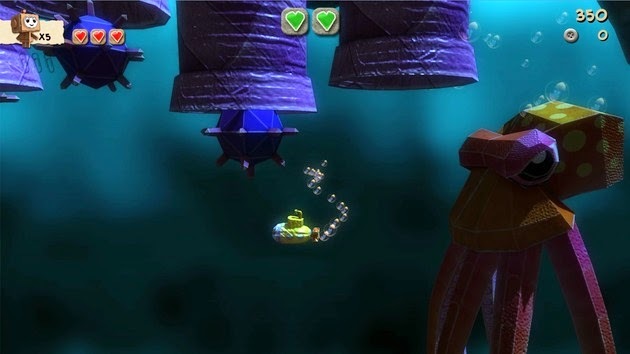 Despite the uniqueness of the graphical presentation, Paper Monsters Recut is still a traditional 2D platformer. You run, leap on enemy heads, you traverse platforms, you double jump, and you explore levels for hidden optional goodies like gold paperclips and golden buttons (the latter unlocks mini-games to play and set high scores on). The simplicity of controls make the game very accessible to beginning players, although the challenge of the game itself isn't very high. Paper Monsters Recut doesn't hold back on giving you copious amounts of extra lives at your disposal, nor does it punish you in a harsh way for dying. You just lose one of your many lives and are sent back to the last reached checkpoint with everything you already collected saved. This surely is no Soul Train. The level design is a mixed bag. 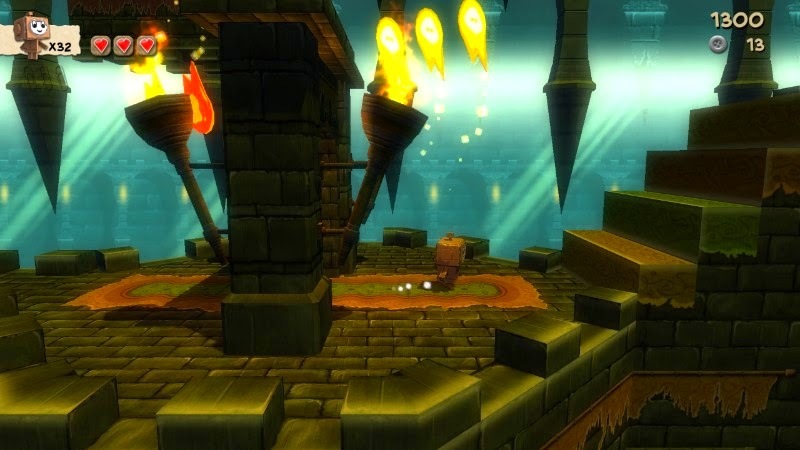 Some levels feature some really clever platforming challenges while others seem hastily thrown together. Thankfully the former type of level design is more abundant than the latter. What's also abundant are the secret alcoves and areas that are teeming with collectibles like extra lives and other goodies. One of the neat touches and gameplay quirks is a Mutant Mudds, Kirby: Triple Deluxe, and Virtual Boy Wario Land way of moving from the foreground to the background plane and vice versa. Of course, sometimes being in a faraway area in the background can make seeing enemies a little trickier than I would have liked, but overall it works well and is a welcome mechanic to the game. with this clever (albeit seen before) gameplay mechanic. There are also times in Paper Monsters Recut where you get a jet pack and blaster weapon to soar and shoot enemies with. The jet pack requires constant recharging at bright blue orbs serving as fuel stations of sorts. These levels add some nice and pleasing alterations to the gameplay. Even without these, however, Paper Monsters Recut would still have enough variety to have kept me interested. 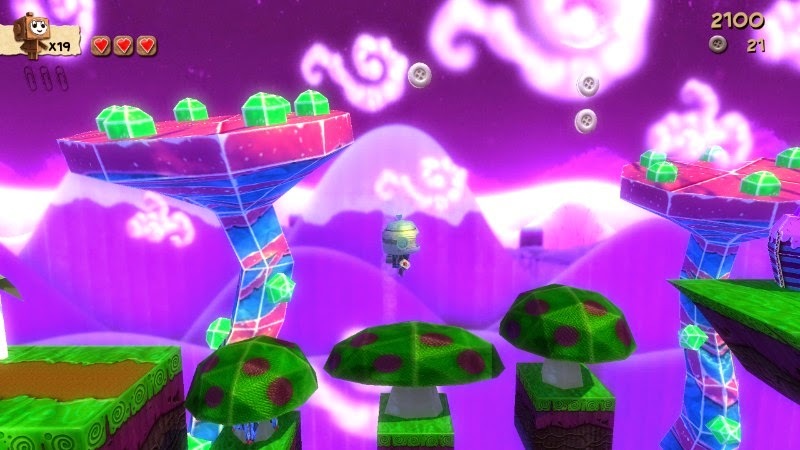 There are approximately six worlds in Paper Monsters Recut, featuring areas like rolling green hills, Halloween-influenced countrysides, ice cold fjords, and vivid jungles. 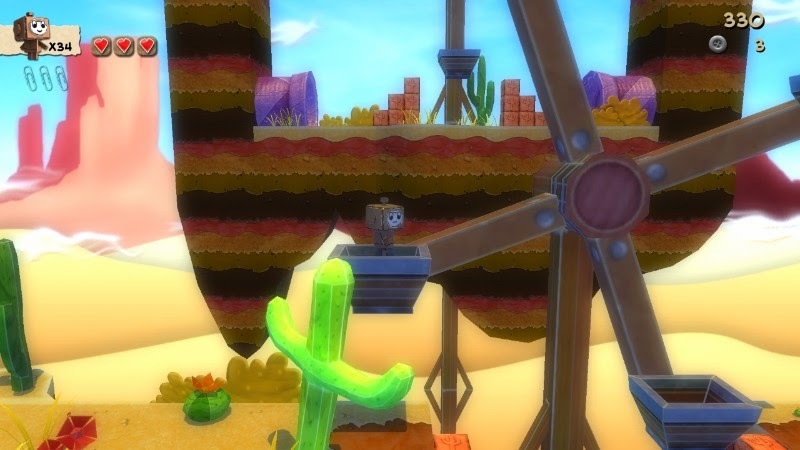 With this enhanced port of the mobile game, the developers at Mobot Studios added some new levels, remixed sections of older levels, and a fleshed-out overworld that has many secrets in it. just like the in-game levels. As for actual levels, the objective is as simple as reaching the goal, which is a makeshift stage for your cardboard character to celebrate on. Of course, to add some replay value you can always go for a better high score (though there are no leaderboards to speak of) and go searching for the aforementioned optional gold paperclips and buttons. The end of every world save for one concludes with a boss battle of some sort. These fights are decidedly the weakest part of Paper Monsters Recut. At their best they are mindless encounters that err on the side of being ridiculously easy. At their worst they seem thrown together at the last point in development to add another bullet point to the game. That's not to say they're awful by any stretch of the imagination. They're just not that special and could have used more time in the oven, so to speak. One particular battle where I controlled a submarine allowed me to safely stay in one place between two pipes letting out mines. All I had to do was fire when a mine was near the boss, an octopus. That was the extent of "difficulty" for this encounter. and this fight will be easy street. Paper Monsters Recut isn't that long of a game. I was able to collect 108 of the 110 gold paperclips and beat the game in less than five hours. That said, I had great fun for the short length the game gave me. Even with THAT said, Paper Monsters Recut is a game that is definitely replay-able, ensuring that you get your money's worth. In a sea of titles released on the Wii U eShop, it can be challenging sifting through the games, distinguishing between the good and the bad. Thankfully, Paper Monsters Recut is one of the good ones, and it seems to be on a system perfect for it, the Wii U. Not because of any special Wii U functionality that makes the game only possible on the system (there isn't anything like that to be found), but because platformers are so welcomed on Nintendo's latest home console. Despite missing a few key jumps along the way, Paper Monsters Recut is a worthwhile purchase for any 2D platformer-loving Wii U owner.